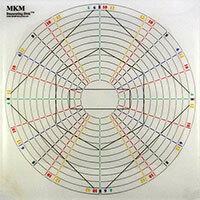 Description The large MKM Decorating Disks come as a set of two 16 x 16 inch (40.5 cm x 40.5 cm) flexible transparent mylar disks. Each disk has a series of concentric circles divided by colored radial lines. At the intersection of the circles and radial lines are small holes that allow the user to mark right through the disk.